Biotin: Biotin, a water soluble vitamin of the B complex, encourages hair and scalp health. 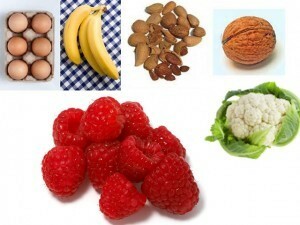 Dietary sources of biotin include nuts, brown rice, whole grains, eggs/egg yolk and oats. Boost Mineral: The minerals silica and zinc are also critical for hair growth. Food sources of silica include cucumber, mango, green leafs, beans. Foods high in zinc are pumpkin seeds, beans, almonds and nuts, eggs. Protein: Hair is made of protein; hence protein in your diet helps for making hair strong and healthy and is mainly found in fish, chicken, dairy products, eggs, legumes and nuts. Omega-3 fatty acids: Food containing omega -3 fatty acids such as flax seed, dry fruits, fish are required to maintain scalp healthy. Drink plenty of water to keep the hair moisturized. Also, hair becomes healthy and grows faster as water flushes out the toxins. Minimum 8hours of sleep everyday helps in fast hair growth as hair grows when at rest. If you notice more than the regular hair falls visit a doctor right away. On an average human have between 100,000 and 150,000 hairs on their head. The number of strands normally lost in a day varies, but on average is 100. In order to maintain a normal volume, hair must be replaced at the same rate at which it is lost. The first signs of hair thinning that people will often notice are more hairs than usual left in the hairbrush after brushing or in the basin after shampooing. 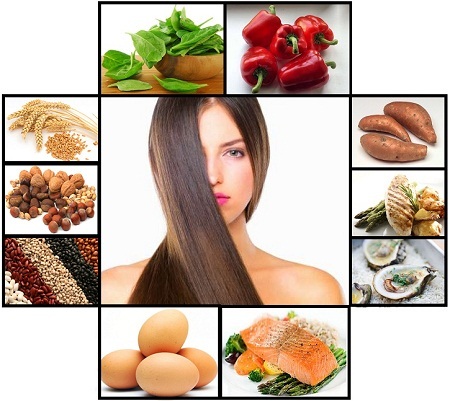 Biotin: Biotin, a water soluble vitamin of the B complex, encourages hair and scalp health. Boost Mineral: The minerals silica and zinc are also critical for hair growth. Sources- Food sources of silica include cucumber, mango, green leafs, beans. Foods high in zinc are pumpkin seeds, beans, almonds and nuts, eggs. Sources-mainly found in fish, chicken, dairy products, eggs, legumes and nuts. Vitamin A, C & E: Helps in strengthening the capillaries and nourishes damaged growth.